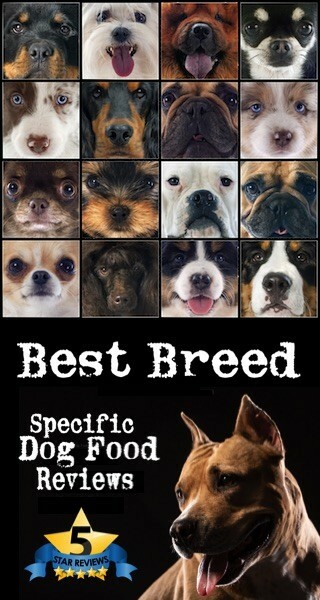 Providing the best dog food for your Mastiff is one of the most important decisions you can make as a dog owner. A Mastiff will require a dog food that nutritionally meets his or her’s dietary needs. The breed will require a diet that’s loaded with two to three protein sources, healthy animal fats, complex carbohydrates, chelated minerals and essential vitamins. The Mastiff will need a substantial amount of calories per day to supply their nutritional needs. According to the National Research Council of the National Academies, an active adult Mastiff weighing 200 pounds requires an average daily caloric intake of 3,710 calories. Additionally, you may quickly realize, feeding a Mastiff can get pretty expensive when trying to meet the necessary calories per day. 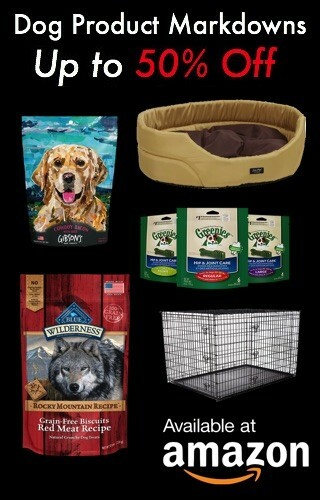 It’s important to find a dog food that not only contains premium ingredients but also is budget friendly. 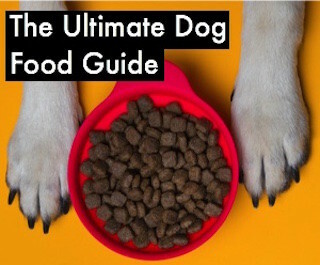 So what’s the best dog food for a Mastiff? 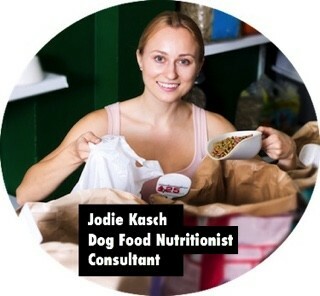 Our team of dog food nutritionists researched and analyzed over 300 large and giant breed dog food brands for the very best based off the nutritional needs of a Mastiff. If you are looking for a premium dry dog food brand for your Mastiff, check out our 5 top-rated brands below. 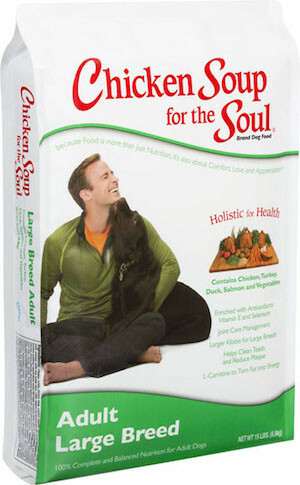 If you’re looking for a budget-friendly large breed dry dog food brand that’s still packed with premium ingredients, Chicken Soup for the Soul Large Breed is an excellent choice. The holistic kibble is popular among Mastiff owners and includes a nutritious ingredient line up including chicken, turkey and chicken meal. The formula is enriched with antioxidants, Vitamin E, Selenium and Zinc. Additionally, glucosamines and chondroitin is also added to help support joint health necessary for a Mastiff. Furthermore, Chicken Soup for the Soul added L-Carnitine to help turn fat into optimum energy as well. This large breed kibble is formulated by Veterinarians from across the USA. CANIDAE’s nutritionally dense formula features optimum proteins from turkey meal. The crude protein and crude fat ratio is balanced and bolds well with a Mastiff’s dietary needs. 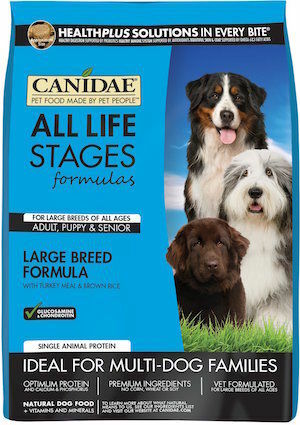 The ‘All Life Stages’ formula makes this brand universal, which is great for dog owners with multiple dogs in the home. CANIDAE is crafted with a HealthPlus Solutions which a healthy mixture of omega fatty acids, probiotics and antioxidants. This healthy mixture is great for healthy digestion, immune system and skin. The family owned company does not add any corn, wheat, soy or animal by-products to any of its formulas. Ingredients: Turkey Meal, Brown Rice, Peas, Oatmeal, Millet, Rice Bran, Canola Oil, Suncured Alfalfa, Flaxseed, Natural Flavor, Salmon Oil, Vitamins (Vitamin E Supplement, Thiamine Mononitrate, Ascorbic Acid, Vitamin A Supplement, Biotin, Niacin, Calcium Pantothenate, Pyridoxine Hydrochloride (Vitamin B6), Vitamin B12 Supplement, Riboflavin, Vitamin D3 Supplement, Folic Acid), Minerals (Iron Proteinate, Zinc Proteinate, Copper Proteinate, Ferrous Sulfate, Zinc Sulfate, Copper Sulfate, Potassium Iodide, Manganese Proteinate, Manganous Oxide, Manganese Sulfate, Sodium Selenite), Choline Chloride, Dried Enterococcus Faecium Fermentation Product, Dried Lactobacillus Acidophilus Fermentation Product, Dried Lactobacillus Casei Fermentation Product, Dried Lactobacillus Plantarum Fermentation Product, Dried Trichoderma Longibrachiatum Fermentation Extract, Salt, Potassium Chloride, Mixed Tocopherols (A Preservative), Butternut Squash, Parsley, Sage, Carrots, Blueberries, Zucchini, Green Beans, Pumpkin. Contains A Source Of Live Naturally Occurring Microorganisms. 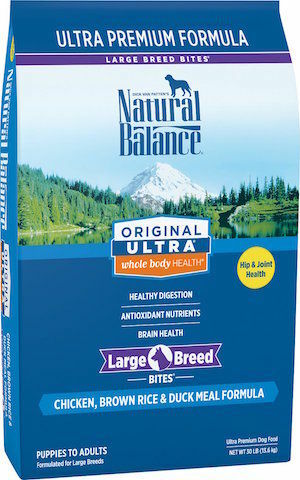 Natural Balance Original Ultra Whole Body Health Large Breed is specifically designed to meet the nutritional needs of a Mastiff. The formula contains rich chicken, chicken meal, peas, brown rice, carrots and duck meal. In addition to a variety of healthy whole ingredients, antioxidant rich-fruits, chelated minerals and essential vitamins are also include in the recipe. 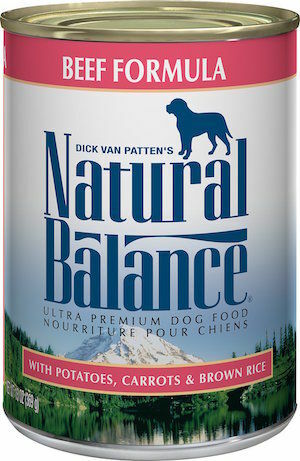 Natural Balance adds oat fiber which is great on a Mastiffs’s digestive system as well. Ingredients: Chicken, Chicken Meal, Peas, Brown Rice, Oat Groats, Pea Protein, Potatoes, Flaxseed, Duck Meal, Carrots, Chicken Fat (Preserved with Mixed Tocopherols), Natural Flavor, Menhaden Oil (Preserved with Mixed Tocopherols), Pea Fiber, Dried Tomato Pomace, Salt, Oat Hulls, Potassium Chloride, Dl-Methionine, Minerals (Zinc Proteinate, Zinc Sulfate, Ferrous Sulfate, Iron Proteinate, Copper Sulfate, Copper Proteinate, Manganese Sulfate, Manganese Proteinate, Calcium Iodate, Sodium Selenite), Vitamins (Vitamin E Supplement, Niacin, D-Calcium Pantothenate, Vitamin A Supplement, Riboflavin Supplement, Thiamine Mononitrate, Vitamin D3 Supplement, Pyridoxine Hydrochloride, Folic Acid, Biotin, Vitamin B12 Supplement), Choline Chloride, Taurine, L-Ascorbyl-2-Polyphosphate (Source of Vitamin C), L-Tryptophan, L-Carnitine, Dried Kelp, Dried Spinach, Cranberries, Blueberries, L-Lysine Monohydrochloride, Yucca Schidigera Extract, Mixed Tocopherols (Preservative), Rosemary Extract, Green Tea Extract, Spearmint Extract. Feeding your Mastiff isn’t cheap, especially when your feeding a premium meat formula. . 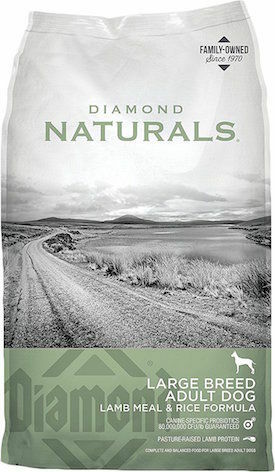 If you are looking to save the most money but still wanting to feed a premium large breed dry dog food, look into Diamond Naturals Large Breed Recipe. Price compared to ingredient quality and guaranteed analysis fits the dietary needs of a Mastiff. Lamb Meal is the #1 ingredient found in this large breed dry dog food brand. The second primary ingredient in Diamond Naturals is brown rice which provides extensive complex carbohydrates to your large breed dog. Rich antioxidants in the form of Pumpkin, Blueberries and Oranges are also included.Furthermore, Diamond Naturals is free of any corn, wheat, animal by-products and BHA preservatives. Guaranteed analysis shows a proper balance of protein (22%min) and fat (12%min). Ingredients: Lamb Meal, Whole Grain Brown Rice, Cracked Pearled Barley, Peas, Pea Flour, Rice Bran, Dried Yeast, Chicken Fat (Preserved With Mixed Tocopherols), Egg Product, Dried Beet Pulp, Flaxseed, Natural Flavor, Potassium Chloride, Salt, Dl-Methionine, Choline Chloride, Taurine, Glucosamine Hydrochloride, Dried Chicory Root, L-Carnitine, Kale, Chia Seed, Pumpkin, Blueberries, Oranges, Quinoa, Dried Kelp, Coconut, Spinach, Carrots, Papaya, Yucca Schidigera Extract, Dried Lactobacillus Plantarum Fermentation Product, Dried Bacillus Subtilis Fermentation Product, Dried Lactobacillus Acidophilus Fermentation Product, Dried Enterococcus Faecium Fermentation Product, Dried Bifidobacterium Animalis Fermentation Product, Vitamin E Supplement, Beta Carotene, Chondroitin Sulfate, Iron Proteinate, Zinc Proteinate, Copper Proteinate, Ferrous Sulfate, Zinc Sulfate, Copper Sulfate, Potassium Iodide, Thiamine Mononitrate (Vitamin B1), Manganese Proteinate, Manganous Oxide, Ascorbic Acid, Vitamin A Supplement, Biotin, Niacin, Calcium Pantothenate, Manganese Sulfate, Sodium Selenite, Pyridoxine Hydrochloride (Vitamin B6), Vitamin B12 Supplement, Riboflavin (Vitamin B2), Vitamin D Supplement, Folic Acid. 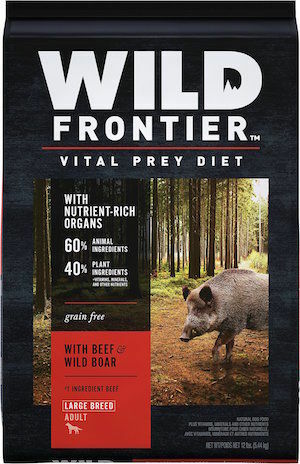 Wild Frontier Vital Prey Diet is a healthy mix of whole animal ingredient and plant based ingredients. 60% of this 5 star dry dog food brand is made with beef, pork meal, chicken meal, wild boar, turkey liver, pork heart and pork kidneys. The remaining 40% is a variety of dehydrated alfalfa meal, pea protein, fish oil, essential vitamins and chelated minerals. Wild Frontier is 100% complete, balanced and grain-free. Furthermore, the vital prey diet contains no corn, wheat, soy or animal by-products. Ingredients: Beef, Split Peas, Pork Meal, Chicken Meal, Dried Potatoes, Tapioca, Chicken Fat (Preserved With Mixed Tocopherols), Wild Boar, Natural Flavor, Dried Plain Beet Pulp, Turkey Liver, Pork Heart, Pork Kidney, Dehydrated Alfalfa Meal, Pea Protein, Fish Oil (Preserved With Mixed Tocopherols), Choline Chloride, Potassium Chloride, Dl-Methionine, Salt, Mixed Tocopherols And Citric Acid (Preservatives), Zinc Sulfate, Niacin Supplement, Biotin, Vitamin E Supplement, Iron Amino Acid Chelate, D-Calcium Pantothenate, Selenium Yeast, Riboflavin Supplement (Vitamin B2), Copper Amino Acid Chelate, Vitamin B12 Supplement, Pyridoxine Hydrochloride (Vitamin B6), Manganese Amino Acid Chelate, Vitamin A Supplement, Thiamine Mononitrate (Vitamin B1), Vitamin D3 Supplement, Folic Acid, Rosemary Extract. If you are looking for a premium wet dog food brand for your Mastiff, check out our 5 top-rated brands below. If you have a picky Mastiff you may want to try mixing a wet and dry combination of dog foods that contains turkey. Turkey is lean, rich in proteins, extremely palatable and flavorful. 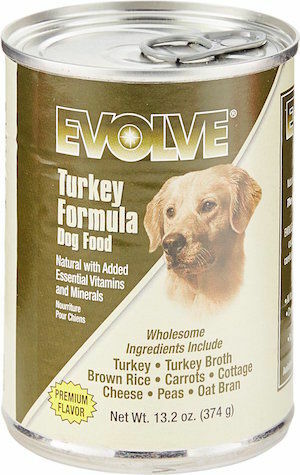 Evolve Turkey Formula is one of the best wet dog food options for a Saint Bernard. Additionally, the turkey is slow cooked to look in rich nutrients and flavor. In addition to turkey, chicken liver, lamb and brown rice is also found in this 5 star wet dog food brand. Healthy amino acids, calcium rich cottage cheese, chelated minerals and essential vitamins complete the formula. Ingredients: Turkey, Turkey Broth, Chicken Liver, Lamb, Brown Rice, Rice Flour, Carrots, Ocean Fish, Dried Egg Product, Cottage Cheese, Peas, Oat Bran, Guar Gum, Potassium Chloride, Sodium Tripolyphosphate, Carrageenan, Salt, Minerals (Iron Amino Acid Chelate, Zinc Amino Acid Chelate, Cobalt Amino Acid Chelate, Copper Amino Acid Chelate, Manganese Amino Acid Chelate, Sodium Selenite, Potassium Iodide),, Brewers Dried Yeast, Chicory Root Extract, Choline Chloride, Vitamins (Vitamin E, A, D3, B12 Supplements, Thiamine Mononitrate, Biotin, Riboflavin Supplement). 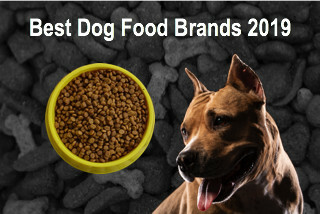 Protein-rich beef is the #1 ingredient in this 5 star wet dog food formula. The hearty-rich stew also includes beef liver, peas, sweet potatoes and carrots. These healthy whole ingredients are then simmered in beef and turkey broth to complete the recipe. Whole Earth Farms is made in the USA and excludes corn, wheat or soy in all of its products. If you’re looking for a premium dog food food formula that’s reasonably priced, check out Whole Earth Farms. 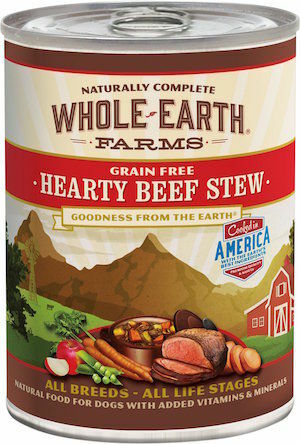 Ingredients: Beef, Beef Broth, Turkey Broth, Beef Liver, Peas, Sweet Potatoes, Carrots, Natural Flavor, Pea Protein, Dried Egg Product, Potato Starch, Calcium Carbonate, Apples, Sodium Phosphate, Cassia Gum, Salt, Sunflower Oil, Potassium Chloride, Choline Chloride, Salmon Oil, Flaxseed Oil, Guar Gum, Gelatin, Caramel Color, Xanthan Gum, Cinnamon, Minerals (Zinc Amino Acid Complex, Iron Amino Acid Complex, Manganese Amino Acid Complex, Copper Amino Acid Complex, Potassium Iodate, Cobalt Glucoheptonate, Sodium Selenite), Vitamins (Vitamin E Supplement, Vitamin B12 Supplement, d-Calcium Pantothenate, Vitamin A Supplement, Niacin, Vitamin D3 Supplement, Riboflavin Supplement, Folic Acid, Pyridoxine Hydrochloride, Biotin, Thiamine Mononitrate), Rosemary, Sage, Thyme, Yucca Schidigera Extract. Natural Balance Original Ultra Wet Dog Food unique blend of highly digestible ingredients is perfect for Mastiffs. Beef and beef liver are the 2 main protein-dense ingredients followed by potatoes and rice. Additionally, oat bran is added for digestive health and antioxidant rich carrots as well. Made in the USA, Natural Balance is 100% complete and balanced per guaranteed analysis. Ingredients: Beef, Beef Broth, Beef Liver, Potatoes, Carrots, Brown Rice, Oat Bran, Canola Oil (Preserved with Mixed Tocopherols), Dehydrated Potatoes, Vitamins (L-Ascorbyl-2-Polyphosphate (Source of Vitamin C), Vitamin E Supplement, Thiamine Mononitrate, Niacin, D-Calcium Pantothenate, Vitamin A Supplement, Riboflavin Supplement, Vitamin D3 Supplement, Vitamin B12 Supplement, Pyridoxine Hydrochloride, Folic Acid), Minerals (Zinc Proteinate, Zinc Sulfate, Ferrous Sulfate, Iron Proteinate, Copper Sulfate, Copper Proteinate, Manganese Sulfate, Manganese Proteinate, Calcium Iodate, Sodium Selenite), Guar Gum, Sodium Tripolyphosphate, Dried Kelp, Salt, Potassium Chloride, Natural Smoke Flavor, Menhaden Oil (Preserved with Mixed Tocopherols), Taurine, Choline Chloride, Carrageenan, Yucca Schidigera Extract, Parsley, Rosemary Extract. 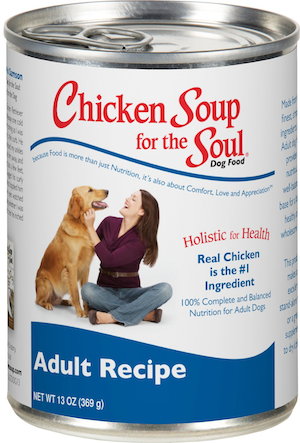 Chicken Soup for the Soul Adult Wet Dog Food is nutritionally balanced for a Mastiff. Per guaranteed analysis, protein and fat ratios are perfect balanced for optimum health. A healthy mix of chicken, turkey, duck, salmon and chicken liver make this wet dog food flavorful and protein rich. Additionally, the formula features rich antioxidants, zinc, vitamin E, and selenium. Ingredients: Chicken, Turkey, Chicken Broth, Turkey Broth, Duck, Salmon, Chicken Liver, Whole Grain Brown Rice, Oatmeal, Carrots, Flaxseed, Peas, Potatoes, Ground Barley, Dried Egg Product, Potassium Chloride, Salt, Cassia Gum, Xanthan Gum, Apples, Cranberries, Dried Kelp, Inulin, Vitamins (Thiamine Mononitrate, Vitamin E Supplement, Niacin Supplement, D-Calcium Pantothenate, Vitamin A Supplement, Riboflavin Supplement, Biotin, Vitamin B12 Supplement, Pyridoxine Hydrochloride Vitamin D3 Supplement, Folic Acid), Minerals (Ferrous Sulfate, Zinc Oxide, Copper Proteinate, Sodium Selenite, Manganese Sulfate, Potassium Iodide), Yucca Schidigera Extract, Choline Chloride, Parsley. 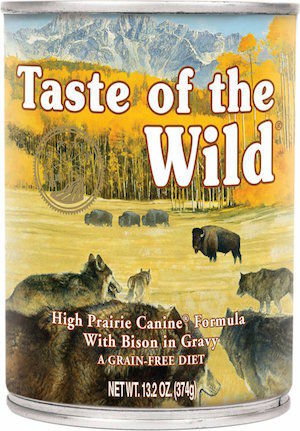 Made out of Missouri, Taste of the Wild is a high volume, popular dog food brand that meets the nutritional needs of a Mastiff. The formula includes protein-rich lamb, liver, bison, venision and egg. Additional prebiotic fibers, blueberries, raspberries and sweet potatoes is also added to the 5 star formula. The formula is grain free and highly recommended for a Mastiff. Ingredients: Beef, Lamb Broth, Vegetable Broth, Lamb Liver, Dried Egg Product, Bison, Potato Starch, Potatoes, Peas, Roasted Lamb, Roasted Venison, Ocean Fish, Guar Gum, Sunflower Oil, Tricalcium Phosphate, Natural Flavor, Calcium Carbonate, Sodium Phosphate, Salt, Potassium Chloride, Inulin, Tomatoes, Sweet Potatoes, Blueberries, Raspberries, Choline Chloride, Yucca Schidigera Extract, Zinc Amino Acid Chelate, Iron Amino Acid Chelate, Thiamine Mononitrate, Vitamin E Supplement, Copper Amino Acid Chelate, Manganese Amino Acid Chelate, Sodium Selenite, Cobalt Amino Acid Chelate, Niacin Supplement, D-Calcium Pantothenate, Vitamin A Supplement, Riboflavin Supplement, Biotin, Vitamin B12 Supplement, Potassium Iodide, Pyridoxine Hydrochloride, Vitamin D3 Supplement, Folic Acid.